Response by Marcott et al. Readers will be aware of the paper by Shaun Marcott and colleagues, that they published a couple weeks ago in the journal Science. That paper sought to extend the global temperature record back over the entire Holocene period, i.e. just over 11 kyr back time, something that had not really been attempted before. The paper got a fair amount of media coverage (see e.g. this article by Justin Gillis in the New York Times). Since then, a number of accusations from the usual suspects have been leveled against the authors and their study, and most of it is characteristically misleading. We are pleased to provide the authors’ response, below. Our view is that the results of the paper will stand the test of time, particularly regarding the small global temperature variations in the Holocene. 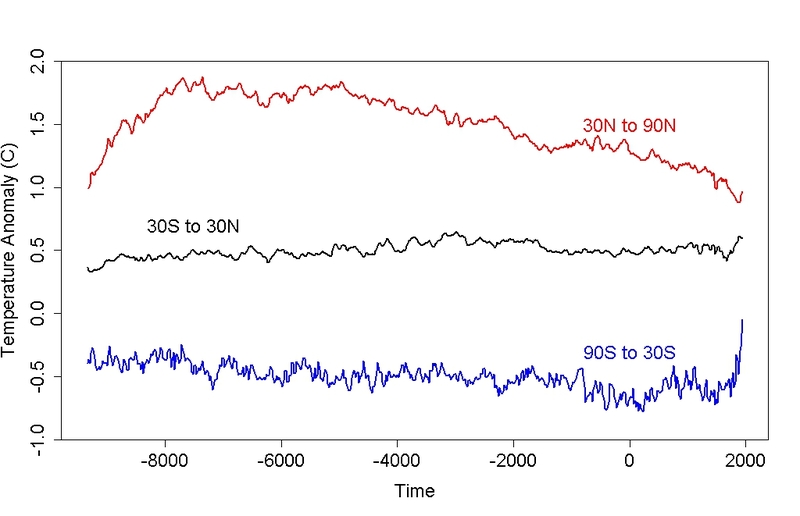 If anything, early Holocene warmth might be overestimated in this study. Update: Tamino has three excellent posts in which he shows why the Holocene reconstruction is very unlikely to be affected by possible discrepancies in the most recent (20th century) part of the record. The figure showing Holocene changes by latitude is particularly informative. The link between extreme weather events, climate change, and national security is discussed in Extreme Realities, a new episode in PBS’ series Journey To Planet Earth hosted by Matt Damon. The video features a number of extreme weather phenomena: hurricanes, tornadoes, floods, wild fires, and flooding. The discussion is about climate change and the consequences on the ground – or, how climate change may affect you. It is important to ask what is the story behind the assertions made in the video. What scientific support is there for the link between such extremes and climate change?